Elliot Noah Ye at his Baek-il party. The Internet has a new king, and it's a 100-day-old baby. Elliot Noah Ye from California has gone viral online after his aunt shared two charming pictures from his Baek-il party. 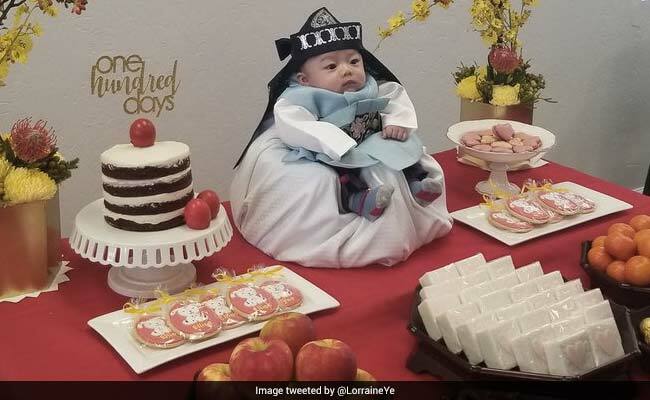 Baek-il is an important Korean tradition of celebrating the first 100 days of a child's life, and little Noah looked absolutely adorable at celebration held in his honour. Wearing a traditional Korean Hanbok and seated on his makeshift throne, on a table loaded with food, Noah made for a sight that melted hearts across the world. It was his regal expression, however, that impressed the Internet enough to nickname him 'King Elliot. "It was my nephew's 100 day and none of us were worthy," wrote his aunt Lorraine while sharing the pics. The tweet collected over 4.6 lakh 'likes' and thousands of comments. "This child banished me from my lands and took my prized horses to slaughter on his own whim and I thanked him for being such a good ruler," joked one person in the comments section. "I too abide by his power and I wasn't even there," another added. He so cute! Congrats to your nephew on being the king of the world! He shall rule for 100 years and the people will love and fear him. Lorraine told Independent.ie that Elliot had a great time at his party. "He was a good boy through the whole party that stayed calm and surprisingly still for all the photos," she said. After achieving viral fame on Twitter, Elliot now has his own Instagram, where the bio reads "the benevolent baby emperor."